Fashion Week has arrived, and one of the big trends of the moment is…statement necklaces! For that reason, I had to share with you one of my latest accessory obsessions that I’ve had for about a month now, and have been wearing multiple times each week because it is gorgeous, represents my favorite season (Fall! 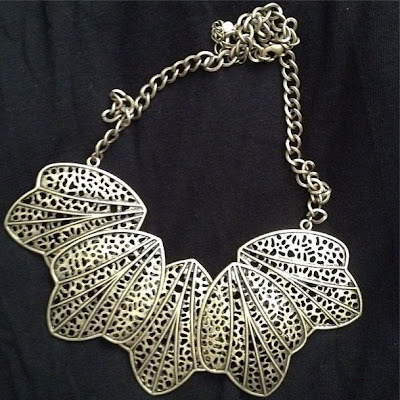 ), and works seamlessly with the statement necklace trend. The item? mark’s Show Your Metal Necklace. If you Follow Me On Instagram @cafefashionista you probably saw me post about this when it first arrived; for everyone else…voila! I tend to lean more towards long pendant necklaces in my accessory choices; however, I wear a lot of V-Neck tops for elongation, so I am always on the hunt for a glamorous bib-type necklace that is lightweight – this one totally fit the bill. The mark Show Your Metal Necklace is a gorgeous antique burnished brass color that is super pretty for autumn, as it makes you think of the changing colors of fall; which brings me to my favorite aspect of this piece…the motif! When you look closely, you realize that the necklace is actually constructed of five oversized layered leaves that are so rich, decadent, and evocative of all things autumn (Pumpkin Spice Lattes from Starbucks, cable-knit sweaters, cognac-hued riding boots…the list goes on and on), that you can’t help but to wish for chilly weather whenever you wear it. An essential for the girl looking for an elegant and affordable luxury to add to her jewelry collection; and an absolute necessity for the classy lady who wants a touch of autumn in her life year-round! This is beautiful! Love the price too. Wow, this is such a gorgeous piece. It looks like a cool necklace to have. Great review too. What a gorgeous statement piece! That's such a stunning necklace. I love pairing statement necklaces with plain t-shirts. I love statement necklaces! I have been dying to get a couple. Hopefully, I will be able to this season. I'm so excited about fashion week :D love your necklace, its gorgeous!! cute piece...and we like the price! This necklace is gorgeous! I really love the rocker look of it. Its beautiful and so great that its so affordable too. This is gorgeous and what a great price!! This is one of my fav necklaces!